I must admit that it's unusual to be reviewing a book co-authored by an alien cosmic being. 'Marlin' is from the 'planet' Pleiades and appears to be a very reasonable sort, with only humanity's best interests at heart. But will he mind about not getting his share of author royalties? I guess this thorny issue must have been covered in advance, when Roar Sheppard and his fellow adepts first sought out cosmic wisdom by communing with beings from other planets. I suppose it's fair to say that I've never been a huge fan of information provided by channelling. I'm even less keen on messages being routed through an organisation which claims as its mission the 'cultivation of eco-friendly graveyards' in the pursuit of 'desirable funeral culture' (p291). It's all a bit weird. But nonetheless, let's take a closer look at 'The Universe Speaks'. Our channelling host begins with a chat with the spirit of Gaia. Ecological disasters are already in progress at the time of writing (the Japan earthquake of March 2011) and this is a foretaste to what is to come, it seems. Initially, I read the interview as a metaphorical exchange of views between humanity and the Earth. As the book continued, though, it became apparent that the interviews are meant to be taken entirely literally. That the meditations undertaken by the contributors of the book (which seem to be multiple) are so deep as to allow the practitioners to literally have an internal dialogue with spiritual beings of immense significance. I would have found this easier to take seriously if the dialogue had been a philosophical one, perhaps similar to that between Plato and Socrates. But the Milky Way is our galaxy. And don't get me started on whatever a "photon belt" is supposed to be. An immense static torus of light that we can't see? Given the factual inaccuracies in these, the very few scientific points presented in the book, I can't have a lot of confidence in the rest of the material. Anyway, according to Marlin, the Earth is a rather special world in the great scheme of things, which is about to undergo a transition from the 3rd to 5th dimension - a two level dimensional ascension, no less. Such is the importance of this cosmic event that many of the denizens of our world at the present time are cosmic beings incarnated here to experience first-hand the shift. The Earth is a sort of spiritual school, providing something of a crash course in spiritual evolution. 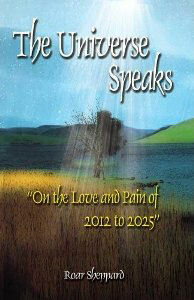 The book presents a series of predictions about the next few years. The transition period runs between 2012 and 2025, with effects already noticeable in 2011. Given the Japanese and New Zealand earthquakes, and the dire economic woes shrouding the West, perhaps this can be said to have come true, so far at least. The author is based in South Korea, so much of his focus is upon Asia, and the Korean peninsula in particular (Marlin's grasp of human life on Earth is also remarkably culture-specific, particularly his penchant for the I Ching). He provides grave continent-by-continent predictions - Europe is singled out for a particularly bad time because of the bad karma from the old empires. In short, we can expect massive earthquakes in 2012, massive solar storms in 2013, a melting of "all the glaciers of the north and south poles" because of accelerated global warming as early as 2015 (by north pole he presumably means glaciers in Greenland), and further trouble through to the transition in 2025. I had to look "moxibustion" up. I'm glad I did, because now I'm totally confident that this is the way to survive a 2-decade-long series of global disasters. As wild as all this might sound, I have yet to cover the really mind-blowing section of the book. Several chapters are 'transcripts' of meditational practitioners encountering famous folk from history. It's a sort of 'Bill and Ted' adventure on the astral plane. We learn much about the lives of Mozart, Socrates, Shakespeare and Mother Teresa, to name a few, from the historical celebs themselves. These extra-dimensional spirits now reside upon other planets, and provide interviews across multiple light years in modern, conversational English. And the interviewers provide reasonably intelligent questions because they just happen to have recently read books about the interviewees. I am quite certain that Roar Sheppard's heart is in the right place. He seems to calling for a change in society towards smaller, self-reliant communities capable of absorbing the shocks of environmental meltdown reaped by the materialist sins of our fathers (and mothers and, yes, us). He seems inspired by the Platonic ideal of the Philosopher King, and is clearly a deep thinker. I also think he is educated and intelligent enough to provide us with an honest book about the world's problems (science aside), along with some decent ideas about how to deal with the whole tangled mess. So why go New Age at all? Subtitled "On The Love and Pain of 2012 to 2015"